The Lamborghini Miura has long been hailed as one of the prettiest cars ever built. 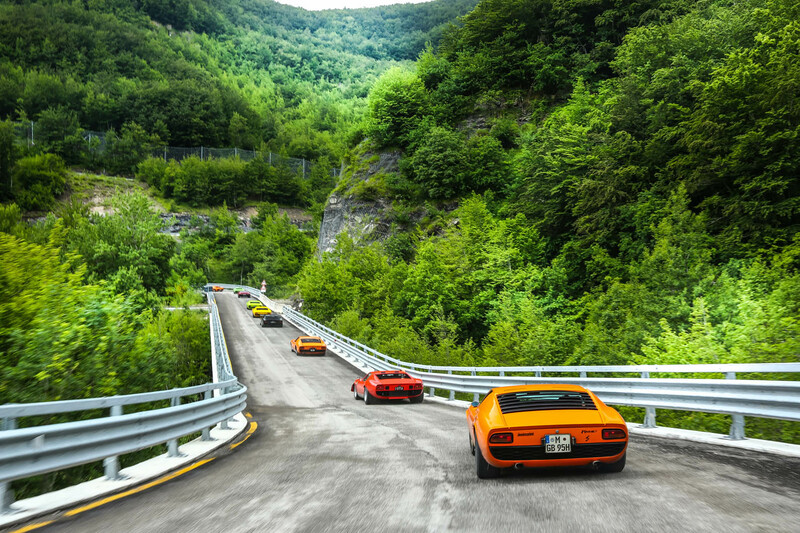 50 years after its birth, we drive one through picturesque Italy. Never trust an ancient Italian speedometer. The needle is touching 260km/h – more than 160mph – but there’s no way the Lamborghini Miura is running at that sort of pace. Besides, there’s a police car alongside my bright yellow SV model as we hurtle down the dual carriageway between Bologna and Parma. Fortunately, the carabinieri are all smiles in their Huracán squad car. And the driver is definitely urging me on, rather than trying to enforce the national speed limit. 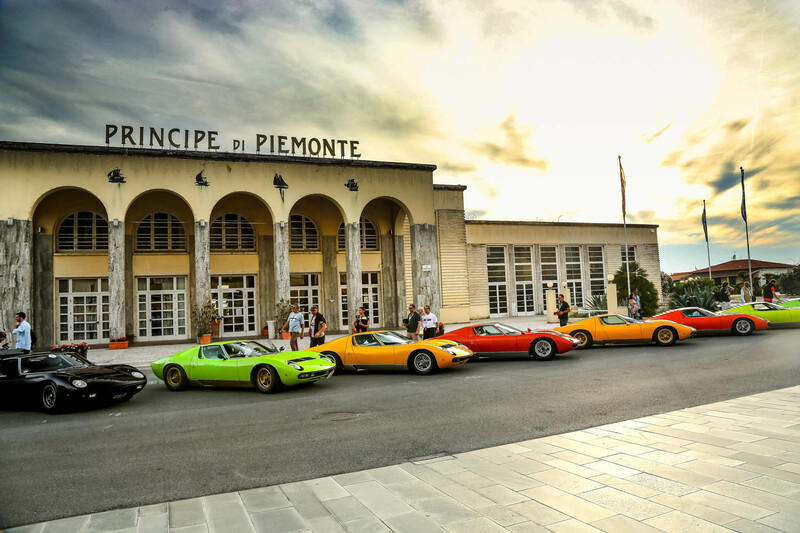 Welcome to the inaugural Miura Tour – a collection of 25 classic Lamborghinis embarking on a four-day adventure across northern Italy. The event has star billing and cars have been shipped from as far afield as Japan and the US to attend. Just 25 Miuras may not sound many, but then Lamborghini built fewer than 800 of these iconic coupés between 1966 and 1973. Only 400 are still believed to be in existence, and the cars here are some of the very best. When it was unveiled at the Brussels motor show in 1966, the original Miura was the fastest production car in the world. It blew away the rival Ferrari 275 and forced the Jaguar E-Type to eat its exhaust fumes. The Miura was special because of its central V12 engine, which was ground-breaking in a road car at that time. Slip on a Bertone bodyshell measuring just over 41 inches tall and the result was jaw-dropping. This, remember, was the year England won the World Cup. Driving one today should be on everybody’s bucket list, not least because it proves how far supercars have developed since Ferruccio Lamborghini unleashed the Miura onto an unsuspecting motoring public. Both the brakes and steering are woefully inadequate and the cabin is a greenhouse, then on top of that there’s an overheating issue. Lamborghini fitted the Miura with two cooling fans, one of which could be manually operated via a switch on the roof when things really warmed up. Consequently, I’m driving the Miura by water temperature gauge rather than that optimistic speedo. I’ve been told to pull over quick if we hit heavy traffic, which may explain why the police are so keen to clear a path at every junction. On top of all the above, there’s little seat adjustment, the clutch action is high and all Miuras are incredibly noisy. So what’s the appeal? Miura prices lulled in the doldrums for decades but have soared in recent years, mirroring a rise in Lamborghini’s overall popularity. A restoration job will cost £800,000, while Sir Rod Stewart’s Miura has been offered for sale at £1.2m. Driving a classic Ferrari in Italy is memorable enough, but touring in a Miura is the stuff of dreams. The Lambo has instant celebrity status. It’s a force of nature, like an E-Type, Ferrari 250 GTO and Aston Martin DB5 rolled into one. I don’t speak a word of Japanese, but I know the guy from Tokyo in a Miura next to me feels the same. He’s got his thumb up, foot to the floor and is smiling like a 10-year-old who’s just heard a Lamborghini V12 for the very first time. The most beautiful car ever built. Worthy of being considered art. Lamborghini is my favorite car making company, fantastic this posting. it is going to explore your system all sync related information, first of all loging the windows 10 microsoft account and easy to arrange your system sync setting.